Mozilla labs recently announced a new project titled ‘Weave‘. The intention being to enable users to have a single source of access for their browser meta-data and also to provide certain social features. The new project is an extension to the concept of cloud computing. The advantage of keeping data on the Web is universal access from any computer with a net connection. 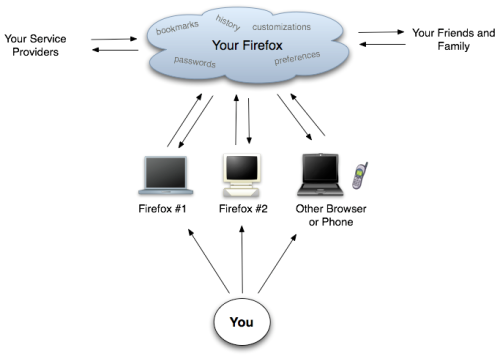 Since a browser is the default gateway to the internet, it makes sense to have all your browser data such as bookmarks available via a single sign on process essentially providing the same functionality you receive from browsing on a PC or mobile or even a kiosk. Mozilla has also made it clear that they intend to only provide a framework for building of platforms and don’t intend to build any complex applications by themselves. The project is into version 0.1 only and many new features are being discussed at the forums. The product has a great utility for users who rely heavily on their bookmarked data and preferences and want to carry their browsing every where on the net. Hi Arun – this sounds like a great idea. I do my accounts on a different computer and it’s annoying when I can’t access my own bookmarks etc when I take a break. Indeed, the new changes make sure that we can carry our bookmarks much as we carry our mail and even documents online. Infact, this is one of the shift that will make possible the decoupling of data and physical connection with particular machines while accessing the web.